Your go-to guide for the dopest spots to cop covetable kicks. It isn’t an understatement to call New York City one of the world’s best sneaker capitals. With so many choices and so many covetable models dropping literally every weekend, the sneaker shopping cycle has been broken down into a science. But as e-commerce gets more popular, the old-fashioned experience of going to a store and getting a pair of shoes becomes even more special. Big companies like Nike and adidas are creating specialized stores that feel more like boutiques, and high-end shops like Barneys are beginning to cater to kick connoisseurs who now feverishly hunt for designers pairs from guys like Raf Simons, Rick Owens, and Saint Laurent Paris’ Hedi Slimane. 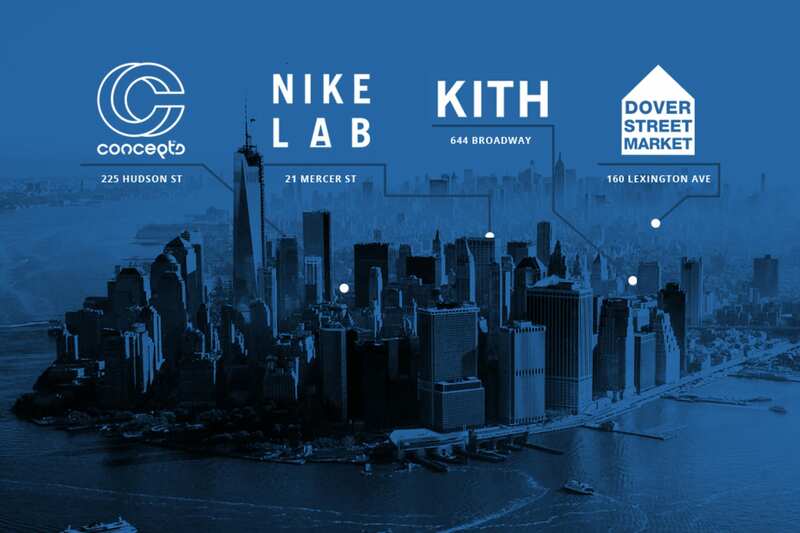 We examined the Big Apple’s current sneaker retail landscape and quantified the ten stores worth trekking to. These are the 10 Best Sneaker Shops in NYC. Located adjacent to adidas&apos; New York offices, the adidas Sport Performance store houses pretty much every single one of the sneaker giant&apos;s sub-lines. Looking for a new pair of running shoes or something to actually play a sport in? The first few floors have you covered. Looking for some rare adidas Originals offerings or some really cool new kicks like the Tubulars or ZX Fluxes? There&apos;s an entire floor for that, too. When the Yeezy 750 first dropped, the Performance Store&apos;s windows provided a place to see the shoes IRL—even if you didn&apos;t manage to get your hands on them. Oh yeah, and this happens to be the first location where Kanye West handed out pairs of his sought-after sneakers the day they officially released. While Barneys hasn’t always been a mainstream sneaker spot, its status as a premium footwear destination has been cemented in recent years thanks to savvy buyers with a laser focus on the discerning sneakerhead. With a Nike Tier Zero account on deck and a range of luxury brands to choose from, Barneys is a prime spot to find some of the most exclusive releases. And with projects like the “BNY Sole Series,” a string of high-end collaborations between brands like adidas, Vans, Common Projects and more, Barneys’ rightful place as one of the best sneaker stores in NYC is unquestionable. There’s a reason why Foot Locker is a juggernaut retailer: It&apos;s the go-to spot for the masses. Its walls are lined with "General Release" sneakers for the everyday consumer—the kind who only purchase sneakers once their current pair gets worn to the ground. While its mass appeal guarantees Foot Locker a spot in just about every mall across the country, its brand cachet and cool factor comes from its House of Hoops initiative. As a partnership with Nike, House of Hoops first opened its doors in Harlem in 2007. HOH&apos;s atmosphere is clearly grounded in sneaker culture&apos;s roots on the court. That isn&apos;t a bad thing—it actually helps reinforce the historical significance of plenty of the retro models sneakerheads currently drool over. The retail space caters to basketball lovers and strictly sells exclusive basketball product that don the Swoosh and Jumpman. That makes it even more appropriate as the go-to place to cop the newest LeBrons, Kobes, and KDs. The shop formerly known as 21Mercer has been reborn as NikeLab, the Swoosh’s answer to highfalutin concept stores and also a means to move super-limited releases. Not only is it the de facto spot to cop HTM sneakers and high-end collaborations like Riccardo Tisci Air Force 1s and Pigalle Air Raids (if you can manage to stand in line that long), but it arguably houses one of the best collections of Nike Sportswear and Tier Zero releases. True to its name, Concepts’ New York location is ever-changing with each release. The buildouts have ranged from a shady trap house themed for its 8 Ball Asics Gel-Lyte Vs to a high-end boutique for its Luxury New Balance 997s. While right now the shop only opens up to sell Concepts’ collaborations the weekend they come out, it’s still a must-see if you happen to be in the area when it’s open. Atmos feels slightly out of place. For one, the New York offshoot of the wildly exclusive Japanese boutique isn’t located amongst the trendiest boutiques in SoHo. It’s uptown on 125th Street, a stone’s throw from the Apollo Theater. The shop is still home to many of the same sneakers that the downtown crowd desires, but is located in an environment closer to the roots of sneaker culture. It may be a hike for most tourists, but on the bright side, it’s also a place to pick up pairs that have long sold out below 50th Street. Dover Street Market has a reputation in London and Japan as being one of the most genre-transcendent retailers, adopting cult brands before they pop off while serving as a testament to Comme des Garçons designer Rei Kawakubo’s honed taste level. The New York City location is home to seven floors of fashion goodness, including a NikeLab on the second floor and a dedicated SNEAKERS SPACE on the sixth floor, stocking heat from Vans, adidas Originals, Asics, New Balance, and higher-end kicks like Common Projects, Rick Owens, and Visvim. Extra Butter may have started off as a shop out on Long Island, but it’s more likely that someone has visited the retailer’s LES location. EB isn’t just one of the best shops in the city, it’s one of the most fun, too. The guys there are known to throw some of the best brand experiences in-store, including a release party that saw a halal truck parked outside. Not to mention that Extra Butter had produced some of NYC’s best collaborations over the past few years with brands such as Saucony, ASICS, and Reebok. It’s worth stopping by the shop for the sneakers it carries, but the atmosphere—which includes scavenger hunts and movie nights—is what keeps you coming back. Ronnie Fieg’s KITH empire is growing rapidly. After last year’s Manhattan redesign, he gave his Brooklyn shop a formidable facelift, linking with the creative geniuses at Snarkitecture for a space that combines modern minimalism with an unmistakably cool atmosphere. Beyond the Jordan IIs hanging from the ceiling, there are plenty of ways to ogle the footwear options on offer, and if you happen to be hungry, you can grab a bowl of cereal or an ice cream swirl from KITH Treats, the cereal bar Fieg’s wanted to open since he was a kid. The originators of New York City’s retail resale market, Flight Club’s gone from sneakerhead insider’s club to one of the best places to gauge a hot shoe’s aftermarket value. It doesn’t hurt that celebrities and tourists with serious dough love to stop in and drop racks every now and then, but even for a casual sneaker fan (or a person who refuses to pay more than retail), the Union Square stalwart remains a shoppable sneaker museum—perhaps even more important than the Brooklyn Museum’s recently opened sneaker exhibition.